Hosted in the cloud. Fully Managed by experts. Exclusive features and improvements. Get started with eduNEXT Open edX as a Service subscriptions. The simplest and most affordable way to power your courses with the open edX platform. Launch fast and effortlessly, learn and adapt your strategy as you grow. Let our team of professionals handle the technology and focus your energy in building, running and marketing the best online learning experiences. Complete, Optimized, Enhanced and Reliable solutions based on extensive experience and the best industry practices. From 1 to Millions of users at the right size and cost. Use our services only for as long as you find us valuable. Expertise. Industry experts take care of your platform proactively and efficiently. World class Infrastructure. Your site is powered by Amazon Web Services (AWS) scalable Enterprise Cloud infrastructure. Quality. You are always protected by eduNEXT Service Level Agreement (SLA), which includes all the details of your service in terms of availability, capacity, security, continuity and service support. Exclusive features. Make the most of your online courses with Additional Reporting Module, Real-Time Analytics, Third party Authentication, Marketing site integration, Google analytics integration, HTML emails & email tracking, External enrollments API, Additional payment processors, Third party XBlocks and more. Instant deployment. Minimize your time to market with our Open edX as a Service solutions. Self-service configuration. The power to adapt and customize your Open edX site as you go. Flexible. Your subscription is priced based on the number of monthly active users and can be configured in monthly or yearly billing cycles to match your demand elastically. Adaptable. Choose from different alternatives based on the features and services you really need to use. Entirely up to you. When you enjoy the liberty of an open source platform, you know that you can always move your installation elsewhere or even make it on premise if you need to. Our terms of service guarantee that you always get access to your data and assistance in case you choose to migrate away from eduNEXT infrastructure. An active user is a person who, in fact, consumes the content in your courses; a learner is not considered as an active user when only registers and logs in to the platform but does not use the content. The open edX LMS is the place where learners and instructors log in to access the course contents, discussions, activities, and more. The LMS delivers the same extraordinary course experience users get at edx.org. This is also the platform where Instructors follow the discussions, communicate with the students, get the course reports and perform other tasks when managing running courses. STUDIO is the course authoring platform, where authors create the courses, add contents, activities and configure the way each course should behave. The eduNEXT management console or EMC is an exclusive feature by eduNEXT where you can access an aditional layer of management tools that help you monitor activity and configure several properties of your Open edX site. The EMC offers you the unique possibility to edit, manage, control, and develop your site according to the needs of your project. Once your subscription is upgraded, your Online learning site (LMS) can be mapped to be located at the domain or subdomain of your choice. Your subscription with eduNEXT includes the SSL certificate and encryption layer to ensure your site is secure and trusted by your visitors. 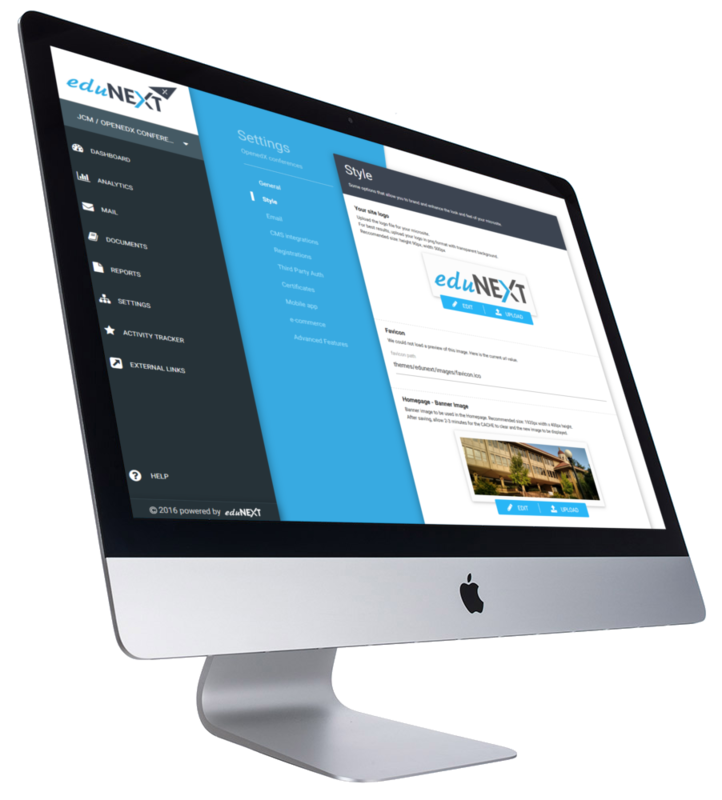 The powered by eduNEXT sign that appears in the platform footer can be removed upon request or replaced with your own logo and linked to your website. On demand and batch certificate generation, exceptions management for certificates, certificates variables customization, and more. Our support team will be available to handle requirements, incidents and problems, or just to keep you updated and help you get the most out of the Open edX platform for your courses. Service levels and customer support delivered under the parameters specified by your Subscription's Service Level Agreement. A higher number of support tickets available, higher availability levels, and faster response times agreed in our gold SLA. eduNEXT's exclusive reporting module simplifies the access information from all your courses at once. It has improved filtering and data exporting capabilities to empower your analysis of data. The edX ecommerce application currently supports Paypal, Cybersouce and PAYU as payment processors. Support for additional payment processors can be developed for a service fee. This is a very powerful add on that allows you to integrate your open edX site with an external CMS, the way edX.org does. Open edX is a very powerful platform for operating your online courses, but it may not meet your flexibility requirements in terms of the content management capabilities in pages such as the homepage, the course catalog, the course landing pages and more. In this scenario, an external website can be run in wordpress, drupal or any similar content management system, to provide all the liberty to publish the web content that your initiative requires, and then have open edX in place only to actually operate the online courses. eduNEXT is pioneering this kind of integrations and developed a Wordpress plugin to simplify the configuration and extend the posibilities of your online learning site. Find out more. This add on enables additional customization options to your Site, giving you extra power to style and improve its look and feel. Changing specific properties in the styles, such as colors, borders, background colors, and more to match your desired look and feel. Adding adds to certain parts of your online learning initiative. Adding your social network feeds to key sections of the site. This add on allows to restrict the registration or access to your site and course catalog only to your approved list of users. This is useful when your site is not intended to deliver MOOCs, but instead small private courses or corporate training. Restrict access to your course catalog or to the information about courses only to registered users. This add on allows to have your LMS site delivered in a language other than english or in more than one language for the learners to be able to choose. To find out the level of transalations available for a particular language visit the Open edX translations page in transifex. This add on allows for batch user creation giving you additional control over the users in your site. All you'll need to do is submit a request with the info for the users to be created in batch using an spreadsheet or CSV format. This add on allows the definition of multiple organizations, to better organize your course catalogue. Once a new organization is added to your site, users will be able to filter courses by organization in the course catalog and you'll be able to configure a different certificate template for each organization. This add on allows your technical team to make secure API calls from an external application to open edX, in order to manage the creation and activation of users. This add on allows your technical team to make secure API calls from an external application to open edX, in order to manage the enrollment and unenrollment of learners in your courses. This service will soon allow to make API calls to obtain data programmatically. Activation of the mobile API's for the open edX iOS and android apps to work against your site's courses. A higher number of support tickets available, highest availability levels, and faster response times agreed in our platinum SLA. The performance of the students in the different scored components of the course. An option exclusively available for PERFORMANCE subscriptions that lets you have more than one site, each one in a different domain, with a different course catalog, and different configurations, but all being managed and billed under the same subscription. We recommend to start small and grow to the extent of your real demand. If you already have a large user base, we offer both As a Service and On premise alternatives tailored to suit your requirements. Make sure you reach out to get a free consultancy and review your specific needs with one of our specialists. Save up to USD 96 with an annual subscription for 50 users! Save up to USD 120 with an annual subscription for 50 users! Save up to USD 444 with an annual subscription for 200 users!